I have always been drawn to photos whether it is in print or on the web. I was interested in photography back in high school when I worked on the school’s yearbook staff, and later took classes at Indiana University to focus on photography. I could say that taking a photojournalism class in college truly sparked my drive to seriously photograph, because up until that point I hadn’t figured out how I wanted to use my visual eye. My path for my major went from Interior Design, to Communication and Culture with a Journalism certificate. I saved up enough money and bought my first DSLR camera in 2011 and then graduated from IU in December of 2012. After pushing my camera’s shooting capabilities as well as expanding my creative talents (like in video), I upgraded my camera to a Canon 7D in January 2014. I continuously try to capture unique angles and perspectives through my work to further tell stories and experiences. In short form, I shoot photos and videos for people and solve their media needs as well as shoot on my own for personal interest. I hope you enjoy what I capture, and the moments I share on my blog. Thank you! 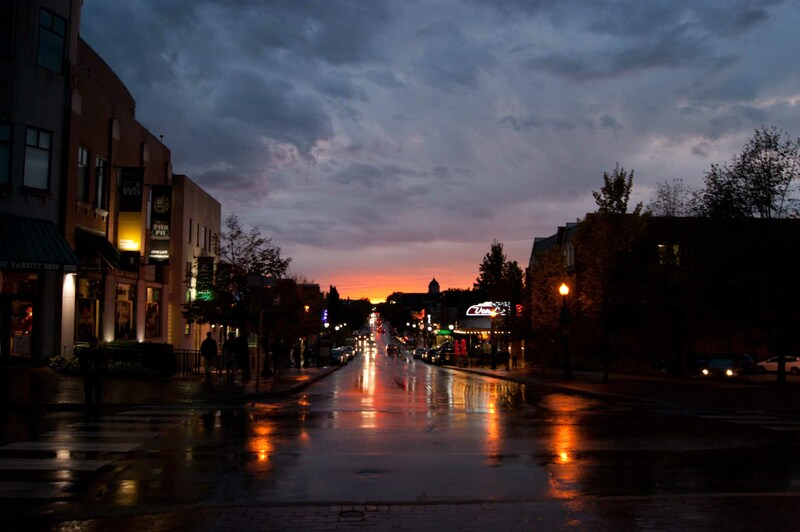 Looking west down Kirkwood Avenue at the rain reflecting businesses and lights on the street in Bloomington, IN.